Glass and Porcelain Insulators made in Argentina. Image Gallery for Glass. 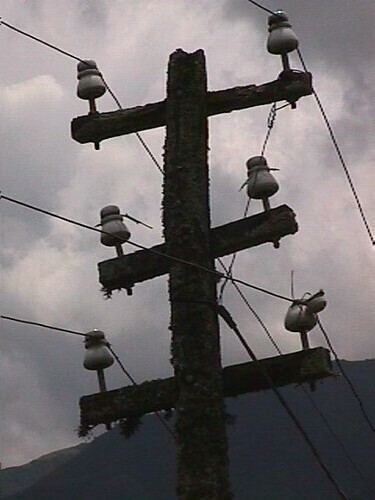 Foreign insulators found in Argentina. Buenos Aires' narrow trail Argentina has a rich railway related history. It couldn't be either way in such a large country specializing it's economy in exportating cereals and meat. The latest years of the 19th century and the beginning of the 20th uptill the proliferation of automobiles and trucks, Argentina wouldn't have existed nor developed if it wasn't for the superb railway system built jointly with British and French companies -the foremost experienced countries within this field. Among the famous railway stories in Argentina is the outstanding and chick Trochita that took us in a journey of history, culture, pleasure and outstanding landscapes, throughout the Patagonia. For more information: Email: Bob Frassinetti. Press here to go back to web blog:Daily Updates on Art, Antiques, Collectibles as well as travel information for Buenos Aires, Argentina. Email Bob Frassinetti. The Buenos Aires Art Dealer,Argentina. Bob Frassinetti. Copyright 2005. Roberto Dario Frassinetti. For more information :Email Bob Frassinetti. Press here to go to The Buenos Aires Art Dealer, our webzine magazine on Art, Antiques & Collectibles made or found in Argentina. The Buenos Aires Art Dealer,Argentina. Bob Frassinetti. Copyright 2005. Roberto Dario Frassinetti. Foreign insulators found in Argentina. outstanding landscapes, throughout the Patagonia. Aires -Buenos Aires Province Railway General company- also known as CGBA. brought from abroad specially from France and Belgium. workers, supplies, knitting the web of our nation. locals, eager to relate their glorious past. More research work is under way, on Insulators,both glass and porcelain, and the railway lines of the Prov of Buenos Aires, if interested in any way, please feel free to contact us. Art Dealer Team. Glass and Porcelain Insulators made in Argentina. As well as Porcelain Insulators made or found in Argentina,see Photo Album. When talking about Argentinean made insulators, FAPA is a must. Born in 1938, FAPA was originally conceived as a porcelain china industry for hotels. This was the first Argentinean white porcelain company, and one of Latin America's finest. Their high quality items gained them a privileged position within the local and international markets as well as prestige and recognition. FAPA's economic and industrial development expressed a broader trend within Argentina's development in the world market. In order to understand the importance of FAPA's development and address the appropiate historical and cultural value to their products it's important to consider this industry's history in a broader way, linked to Argentina's development. During the 30s Buenos Aires was one of the world's largest capital cities with an immense flow of visitors; Argentina's main income provider was it's rich countryside: cattle growth as well as a pushing agriculture were the basic foundations for a prime material export industry. At that time, the Argentinean industry was also growing at a fantastic rate, but it was very dependable on foreign machinery. Soon came World War 2, and everything changed. This event had a deep impact on the Argentinean economy in spite of the fact of it's faraway location from the war zone and that Argentina entered the war just a few month before its closure. Considering the fact that Argentina's economy was European dependable -as markets and machinery producers-, the war changed everything. Even more things were altered due to domestic politics; Juan Domingo Per?n was president at that time and his national development policies concerned mainly a focus on locally produced items, as a way of lowering the foreign dependence of the local economy. It was in this context were FAPA was reorganized, and from a white porcelain china company, it became an insulator industry. Professor Leopoldo Armanino and his brother Aquiles who had created the Fabrica Argentina de Porcelanas Armanino S.A -Armanino Porcelain Argentinean Company- 10 years ago, redirected FAPA's efforts to a larger, broader and never experienced before industry. The development of the local industry thanks to the government's favorable policies, the war-produced shortage of foreign products and the massive use of electricity were the initial favorable preconditions for the transition. It was a success. FAPA's plant was altered and improved to fit the company's new needs. In 1954 FAPA built the first and biggest High Tension lab in Latin America. It had a 1.100.000 volt capacity. And soon FAPA was the only Argentinean and Latin American company manufacturing High Tension line (132 and 220 Kv) insulators. FAPA's production throughout the 60s grew at a fantastic rate. During the 70s their need of growing and developing, at the time they researched on the latest technology within the insulator production field, lead them to work together with Japanese firms. Among FAPA's greatest developments and products we can point out the in suspension High Alumina Ceralum porcelain chain insulators, unique in its type within Latin America, weighing up till 16 tons. 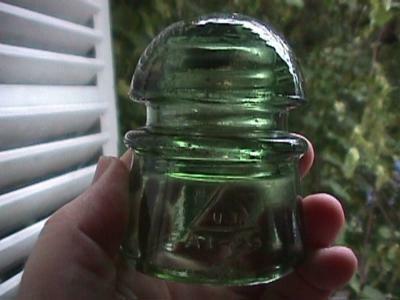 They've also produced glass insulators as well as over-voltage arrest insulators. The list goes on and on for this market leader firm. Worldwide insulator collectors very much appreciate these Argentinean made insulators for their quality, as well as a vintage and rare insulator produced in Latin America, for most Latin countries imported their insulators from the States, Great Britain, Germany, France, and of course, Argentina for a great part of their history. When considering these fine Argentinean insulators it's important to bare in mind that FAPA integrally produce each of them. From designing them at their workshops to the prime material with which they are produced -that's extracted from the Company's mines- every particle of these insulators is 100% FAPA.